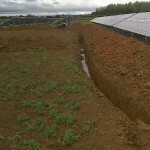 Last week saw the plinth for the inverter shed laid and all the trenches for the cable dug – from the panels to the inverter shed and from the inverter shed to the buildings where the electricity will be used. This week should see the panels strung together and the cables laid in the trenches. Western Power Distribution are installing a new HV transformer on site which is needed to allow us to export the full capacity. 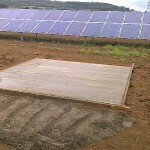 They cannot install this until August, but we will be able to connect up part of the site before this, and are working on getting the one set of 140kW connected before the end of June, with the remainder of the panels to be connected as soon as the Western Power transformer is in place. Last week saw great progress at the Glebe Farm site. On Monday 13th the erection team arrived and started to install the framework for the ground mounted panels. 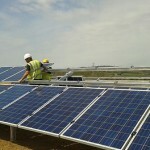 By Monday 20th the framework was all in place and the 1000 panels were all bolted to the framework. The next stage is to wire all the panels to to the inverters and put in place the cables to connect to the buildings. All running well to schedule at present. The share offer for Pomona Solar Co-operative is now launched and the share offer document can be downloaded form the download page of the website. We are pleased to say that the launch of the main share offer has now been decided. The share offer will launch on 5th March, and on this date, the share offer document will be uploaded to this website. Please register your email on the website and you will then get a reminder of this which will give you all the information you will need to buy shares. We’re very pleased to announce that our pioneer share offer has closed, with the full £66,000 of shares now sold and in the process of being allocated. This enables us to progress with the project speedily – expect to see a further share offer early in the New Year and construction soon thereafter. Our thanks go out to our 40 fantastic pioneer members! We’re very pleased to say that the Pomona pioneer share offer is closing in on its target of £66,000 -we have just gone past the £50,000 mark. The grid connection has now been secured by a payment to Wester Power and we are working to complete the legal agreements on the site. 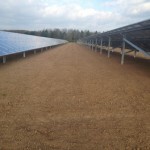 That means we are on track to carry out the main share offer early in 2015 and install the panels shortly thereafter – hopefully in time to catch the first rays of Summer 2015. Pomona will be taking part in the Seeds for the Future event at the Courtyard Theatre, Hereford on Thursday (6pm-9.30pm), as part of the h-energy festivities. It will be an evening of music, film, story telling and discussion around the future of living more sustainably in Herefordshire and there will be a chance to pick up a share offer document for Pomona and to ask us any questions you have about our plans. H-Energy Success and first Applications! 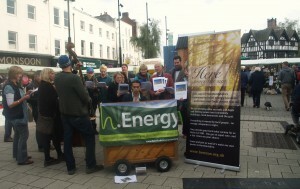 We had a great turn out for the H-Energy Market Place in High Town, Hereford on Saturday. 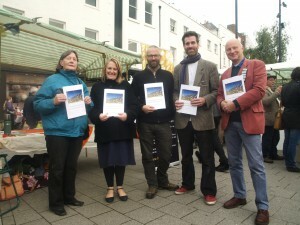 Many thanks to everyone who came to visit our stall and the enthusiasm shown for Pomona’s plans. 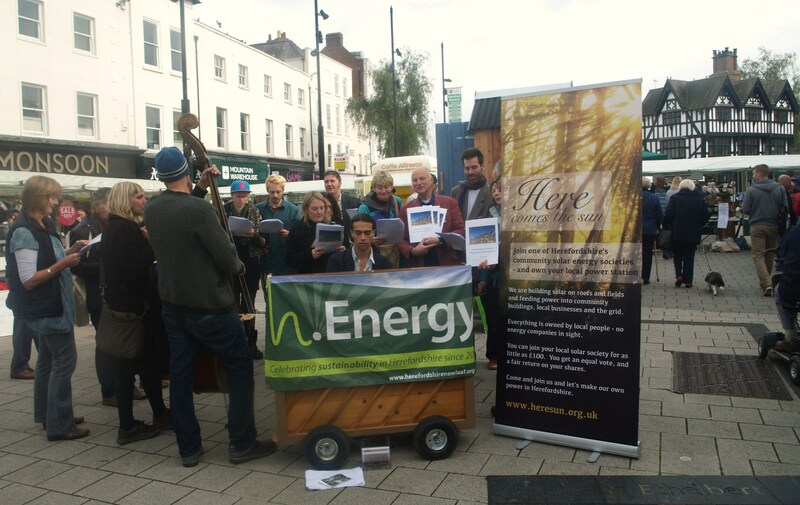 Our ‘sunshine sing along’ accompanied by the H-Energy travelling piano was great fun and may feature in the next edition of the Hereford Times, as we spotted their photographer in the crowd. It’s great to see the first share applications arrive too, so thanks again and please keep them coming! We’re delighted that Tarrington Parish Council have since supported our planning application formerly. The environmental health officer for the council has no objections either and we’ve had a number of supportive comments submitted so far from members of the public – many thanks! 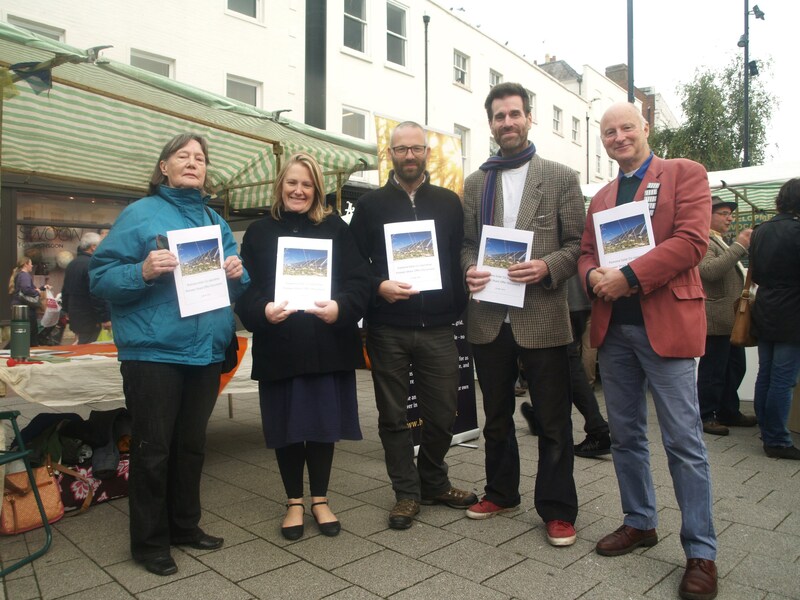 We’re arranging to attend the Stoke Edith parish meeting this weekend to explain more to them and we’re gearing up for the launch of the first share offer at ‘h-energy’ Market Place in High Town, Hereford, on Saturday 10-3.30pm. Be sure to come and see us then, to find out more.